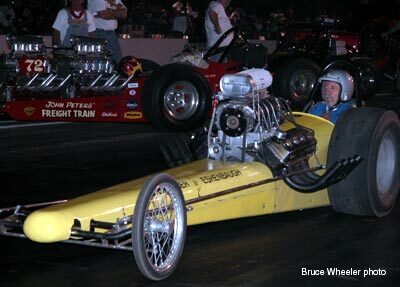 One of the original nine Cacklefest cars, the Steinegger & Eshenbaugh AA/FD (1962-1964) comes with impeccable documentation as one of the quickest and fastest dragsters to hail from Arizona in the 1960's. 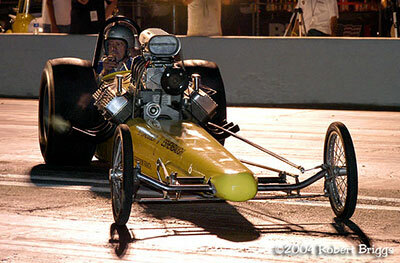 Driver: Al Eshenbaugh. Hometown: Phoenix, AZ. 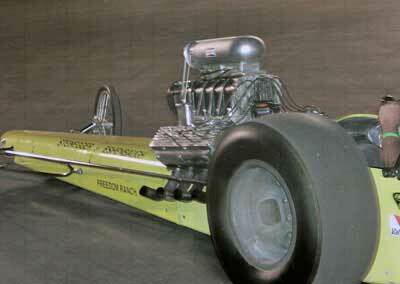 This car, with a 130" Rod Stuckey chassis and a 392 hemi on 98% saw runs of 6.98 at 208.00 during its era. 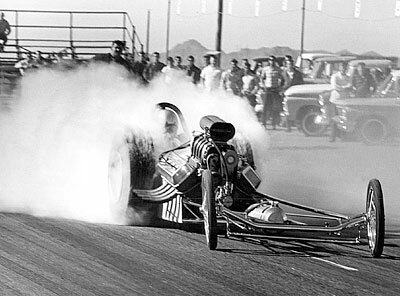 In addition to winning no less than 15 Top Eliminators in a row at Beeline Dragway in Phoenix during 1964, it also took first place one year at the Arizona Fuel & Gas Championships and held the No. 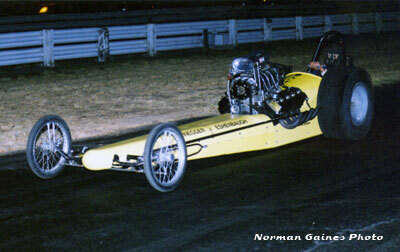 9 spot on the Drag News Mr. Eliminator List for a period of time. They were Arizona State Champions in 1964 & 1965. 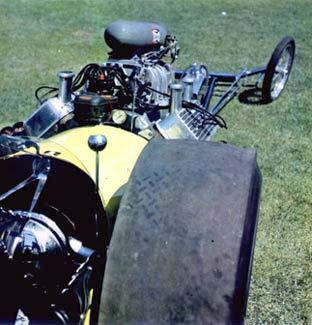 S&E believed in function over form so the car was, by definition, no frills. 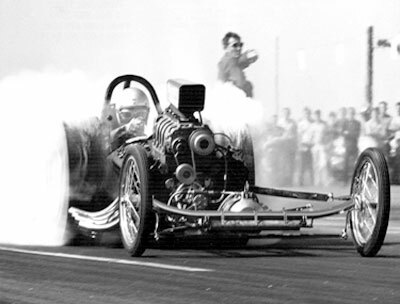 This fuel dragster was built to race and that's exactly what it did. Larry Steinegger and Al Eshenbaugh teamed up in the late 50s and had other race cars before this one - which was their last. 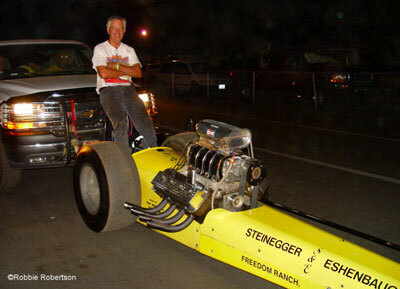 Their teamwork and friendship was solid and long lasting with Steinegger making the horsepower and Eshenbaugh pushing the pedals. 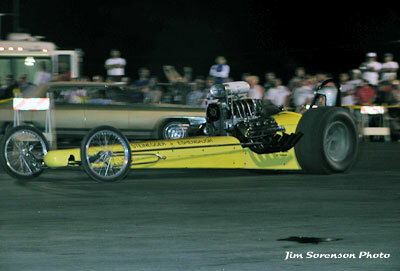 The "business coupe" Rod Stuckey car looks about 60" long in this shot. In fact it was all of 120". 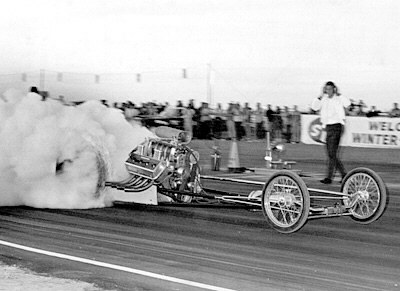 Sporting its one-of-a-kind Hilborn injector, the S&E car boils the hides at Bee Line Raceway in 1964. 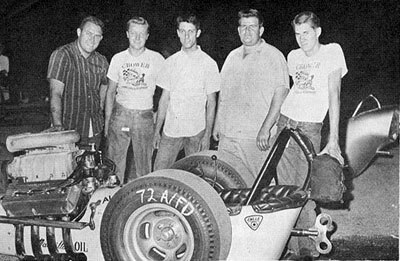 In 1964, after another win at Scottsdale, AZ John Becker, John Hawkins, Al Eshenbaugh, Larry Steinegger and Dave Beck pose with the car. 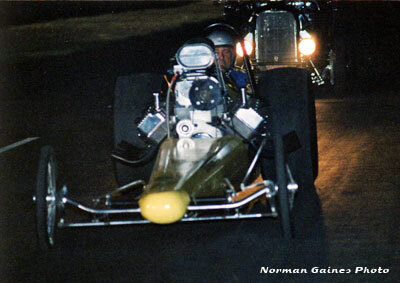 Great shot of "Steinegger & Eshenbaugh" (with the nose piece) out on Pete Ogden in the "Scrabonia & Guasco" car at Lions Drag Strip in 1964. 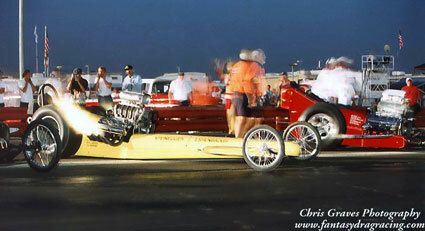 Nice staged shots of the Steinegger & Eshenbaugh AA/FD in 1965... the year the car ran a stunning 7.48 at 208.60 MPH. "For fun" they made a pass starting 150 feet behind the actual starting line and in 1470 feet ran a blistering 237.60 MPH. 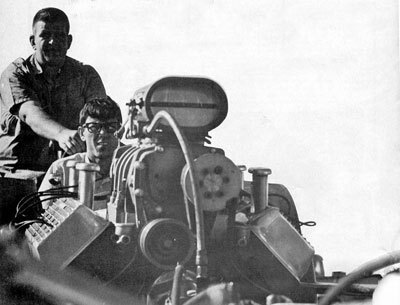 After selling the car in 1966 Steinegger and Eshenbaugh did their own things including raising families. The car was just a great memory for them. 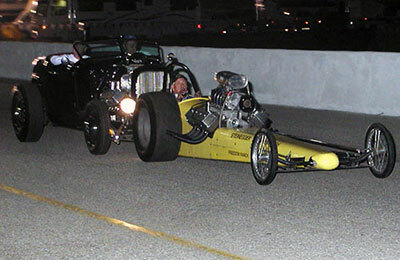 It wasn't until the California Hot Rod Reunion's became the event of the year that Steinegger's interest in drag racing was revisited. But even then he didn't actively seek out his old car - that happened by fate. 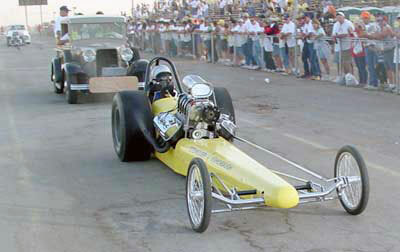 In early 1999 an old friend of Larry and Al, Tom Walsh was checking out wrecking yards and body shops for treasures when he found a dragster chassis behind a small body shop in Higley, Az. He called Steinegger and wanted him to help identify the thing. Walsh thought it was their old car but wasn't sure. On instinct he bought it and brought it home. Sure enough it was the S&E Stucky car. The rear end had been moved and the front axle and torsion bar were gone. 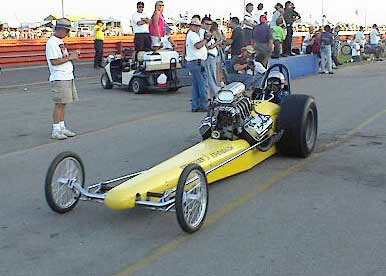 The chassis also had some "new brackets" and small block Chevy motor mounts. 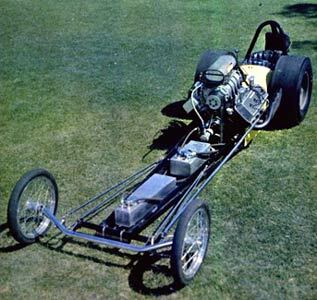 Not "needing" a dragster, Tom Walsh was looking for racing stuff to decorate his house and Steinegger had an old windowed 392 with a couple of rods out the side. 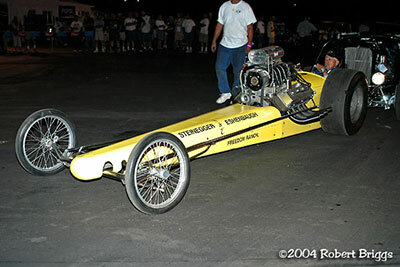 The trade was made and Walsh had a coffee table... Steinegger had his old dragster. Everybody was happy. 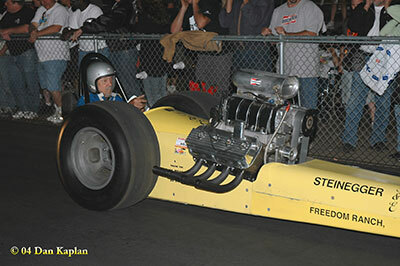 Steinegger then took the car to Paul Henderson's shop and started thrashing on it. They had lots of pictures and memories to go by and also help from Clint Brown who built the original nose and other body parts. Steinegger is a self proclaimed 'pack rat' and was amazed at how much stuff for the car he had stashed away. 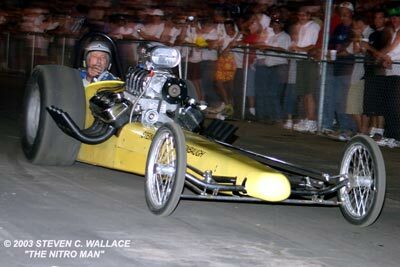 He had Hemi parts, blower drive parts and the original steering wheel. Ray Agee even had the original push bar key and he donated it to the cause. A lot of elbow grease and machine work from J.T. Stewart and the thing came together... but not instantly. 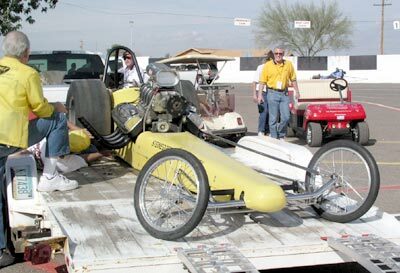 The S&H team showed up at the 2000 CHRR (Cacklefest One) with the car in pieces... hauled from Arizona in a four horse trailer and they finished it up in the pits. 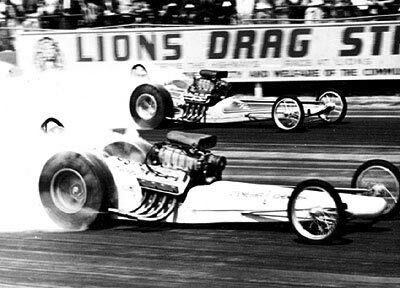 Drag racers then, drag racers now. 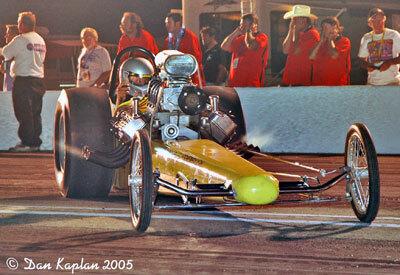 Al Eshenbaugh, engine lit, makes his way down the fire-up road at Bakersfield during Cacklefest One in 2000. No frills car - no frills trailer. Al Eshenbaugh 2002 Pre-Cacklefest parade. 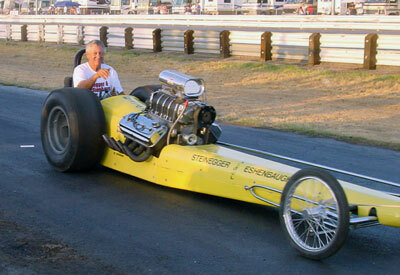 Albert Eshenbaugh and Larry Steinegger have a knack for luring blonds into their race car. Their only complaint - it wasn't this easy 42 years ago! 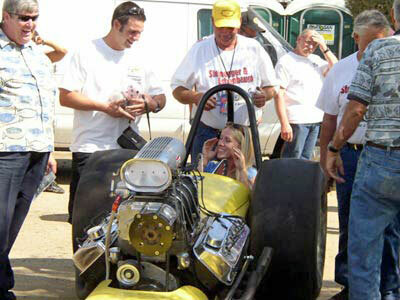 The S&E car is one of only four that has never missed a Cacklefest and the duo plans to be at many more.